FOR IMMEDIATE RELEASE: Portland, Maine (October 2, 2018) – Staying undefeated for long in mixed-martial-arts, at any level and in all weight classes, is a rarity. 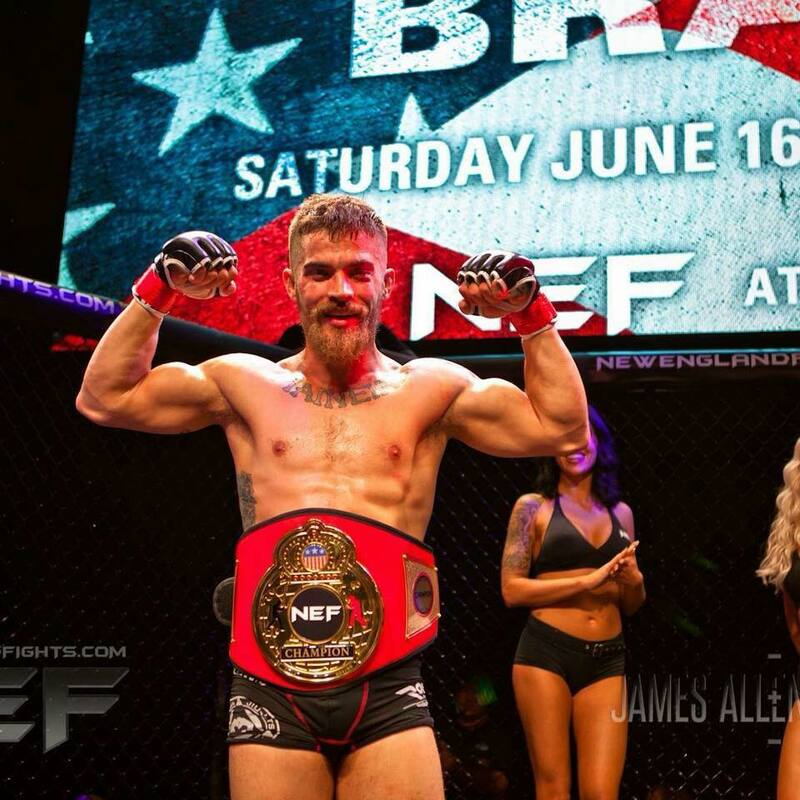 And as one who carries that albatross, New England Fights amateur bantamweight champion Kam Arnold believes he has figured out the human nature of it all. Arnold, who is 4-0 with four consecutive stoppages since first entering the hexagon, will defend his 135-pound strap at “NEF 36: Battle for the Gold” against Walt Shea (3-1) on Saturday, November 17 at Aura in Portland, Maine. A native of Casco, Arnold knows it will be a tough and heavily anticipated bout, only a few miles from the home base of each combatant. “The guy has a ton of heart. He’s definitely going to make me work. He’s an inspiration to a lot of people,” Arnold said of Shea. “He’s just an all-around grinder. He’s not going to do anything too flashy. Few opponents have been able to hang with Arnold, who debuted in June 2017 and took out Glenn Kasabian, Kyle Kenney and David Thompson, all in three minutes or less. A title fight against Killian Murphy was substantially more demanding. Arnold counts his fourth-round technical knockout victory as a learning experience. Although he had been on a run of rapid finishes, Arnold took a more cautious approach against the dangerous Murphy. Conventional wisdom says that Shea, who fights out of Brunswick’s First Class MMA, will try to take the title scrap to the ground. Perhaps as a reflection of his renewed focus on himself instead of worrying about his opponent’s game plan, Arnold sees such a scenario as a chance to open some eyes. “I definitely know what he’s best at. He’s definitely good on the ground. He’s got great grappling, definitely a good clinch game,” Arnold said. “He’s definitely going to be a strong guy. I don’t see him striking with me. If he does, I think it’s a death sentence on his part. Arnold is determined not to buckle under the pressure that accompanies his spotless record, but he said it’s all around him, every day. Other promotions have called to inquire about his services, but Arnold is both wise to the nature of the business and loyal to the NEF organization that launched his career. In addition to an excessive focus on wins and losses, other undefeated amateurs have been sidetracked by the decision to hit the professional ranks before they’re fully schooled in the game. Arnold compares his approach to a certain football coach with five world championship rings in his showcase. “I definitely want to turn pro, but I kind of like the (Bill) Belichick mentality. One game at a time, one fight at a time,” Arnold said. “Take care of Walt, take care of business November 17, and then I’m going to see what lies ahead. I’ll see what the best opportunity is for me. If I were to go pro, I’m going to have to train for a while. I have a long career ahead of me. Training partners with their own proven success in the MMA arena – Matt Probin, Jesse Erickson and Dustin Veinott – help keep Arnold grounded. He also has great support at home from fiancée Ciara, who is expecting the couple’s second child.